Want to join an SI Study Table? You may be in a course where you've heard about/joined a Supplemental Instruction (SI) study table. SI tables meet weekly for 50 minutes, and they take you out of your larger course and place you in smaller groups of students (6-10) to study and learn the material. SI tables are led by students who've already been successful in the course and are sitting through the course again with you. They know what you've covered in lecture, and design lesson plans that engage you in active learning activities. Active Learning is integral to your learning and memory process! 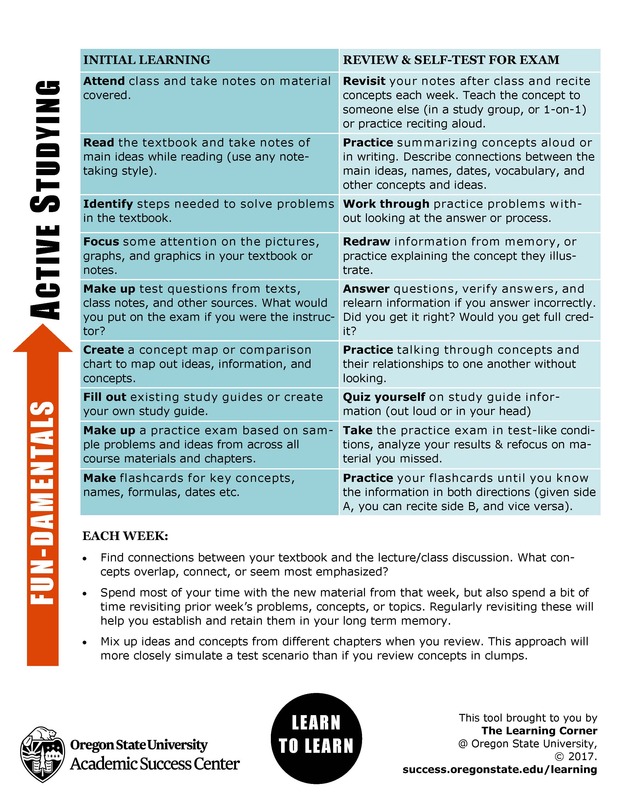 You can take the strategies and activities that you learn in your SI tables and apply them to your other courses, too. While the ASC offers SI tables for several historically challenging courses, we unfortunately can't provide SI for every course offered at OSU. This is where you come in! If SI isn't offered for your course, study groups can be an extremely effective way to study and practice the content you're learning, too. Yes: we know that study groups can be a great way to learn and apply material and concepts. And yes: we also know that study groups can be challenging at times (and group projects can be challenging too). When we talk with students, we hear about frustration around divvying up workload, undefined roles, work not being delivered on time, and more. Collaboration can be hard, but it can be fantastic and amazing and helpful, too; and, it will be something you'll be engaged in throughout your life. If anything, in many cases, teamwork and collaboration only increase when you leave college and enter the workforce, and the ability to work well with others is one of the top 12 qualities that employers look for in their new employees. It's important to hear others' ways of solving problems, to hear the methods they've developed that help them remember information, to hear how they take their notes from lecture and videos and textbooks and combine and transform them into new and robust study materials. And it's important to be in the position to share this information and to explain concepts and summarize main points and takeaways - to teach others - yourself. Study groups also provide the opportunity to compile notes - everyone will take notes differently, and may catch things that you didn't, and vice versa. And study groups give you the opportunity to practice what you've learned in the form of testing each other - perhaps you all write an example test question and exchange them. Perhaps you all take a practice test together, and then work through the answers as a group, explaining what's challenging still and identifying where you need to spend more time. If everyone is confused about the same thing, or if several of you are, and you're not reaching clarity in your group, take yourselves to office hours and connect with your instructor for additional details and information/explanation/help. Take the initiative to set the group up: reach out to the peers in your courses. 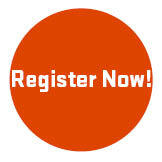 Exchange names, contact information, and find a time you can meet. Decide your purpose: are you meeting weekly to review, or will you meet a couple times ahead of exams to quiz each other and prepare? Knowing your purpose will help you to frame your sessions. 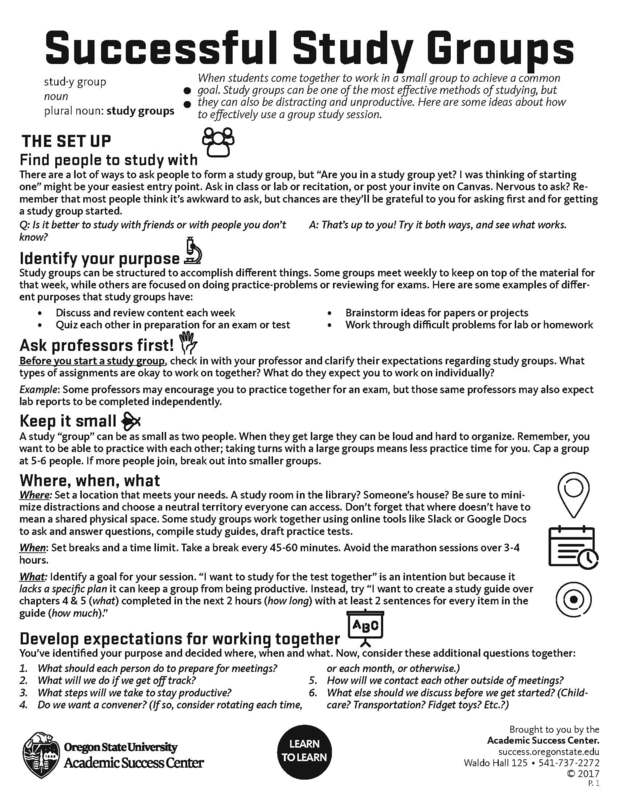 Take time to check in with your professors at the start: do they have any expectations around group work and group study? Be sure to know before you get going. It may inform how you proceed in your work together and how/what needs to be submitted to your instructor. Define roles: will one person set the meeting dates, or issue the Doodle Polls to determine when you can meet? And will one person get you all back on track if you get sidetracked? Will someone gather everyone's notes or practice test questions and assemble a study guide or test? Get to know each other and see what you need and who would like to do what. Then, help to keep each other accountable. Being intentional about clarifying the above aspects prior to jumping in to your work together can set you up from the start for a successful study group. 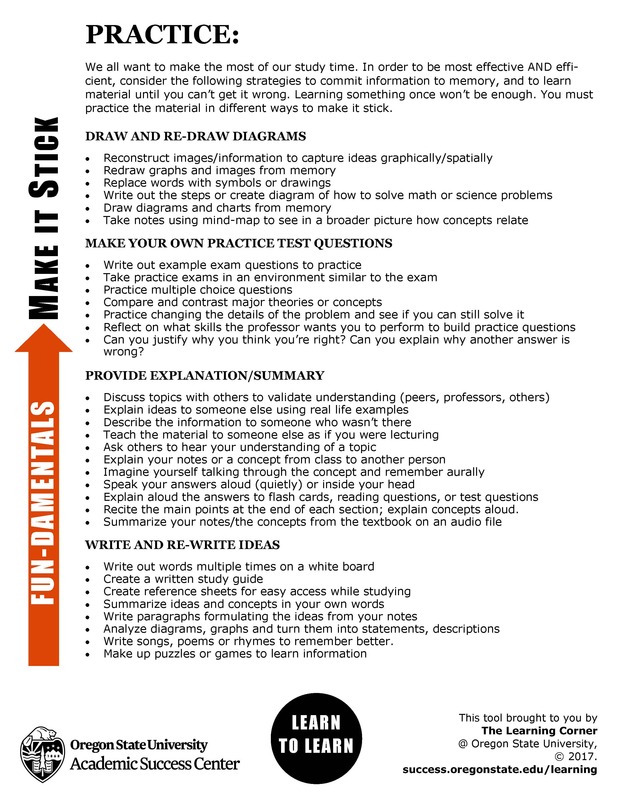 To find activities that you can use in your work together, take a look at our packet (see below, too), and at our Active Learning Strategies handout and our Make It Stick handout, too. If you want to talk more about any of this, either individually or with your entire study group, swing by our Waldo Hall 125 space Monday through Friday from 9 AM to 5 PM. You don't need an appointment! And we love to talk about this stuff with students, so come and chat and make your group work great this year!